PCE Legend of Hero Tonma (USA) in 05:08.23 by nitrogenesis. 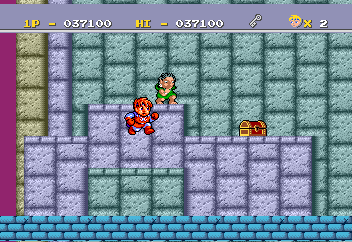 Legend of Hero Tonma is a simple platforming game where Tommy, the main character, goes on a quest to rescue a princess. The game also has some amusing examples of awkward English in between stages. NitroGenesis improves the previous movie by 8.66 seconds. Read the submission text for more information.